What's Up With Buffalo Bayou Park's Recovery From Harvey? The dog park may reopen sooner than you think. Erosion along Buffalo Bayou after Harvey. 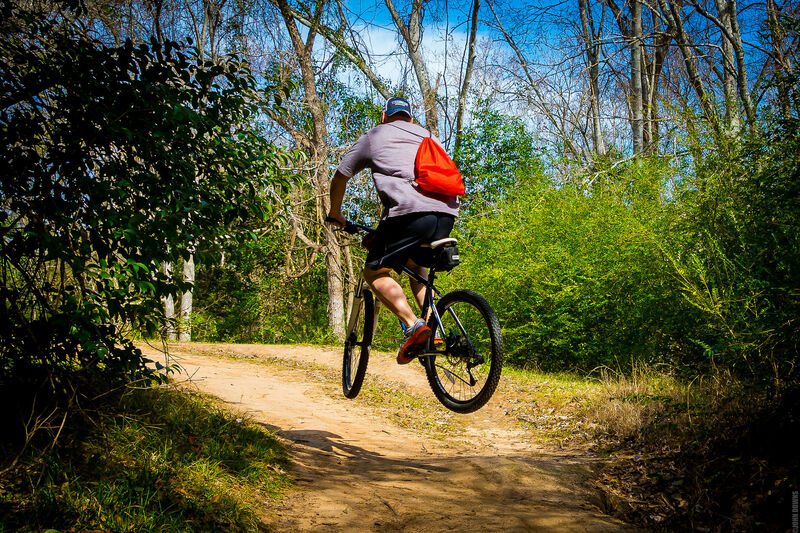 For those of us who run and walk along the banks of Buffalo Bayou Park every day, there are those areas we know to avoid still, but much of the trails are actually looking like trails again. The mounds of sediment that, for months, have turned the Johnny Steele Dog Park and surrounding area into a sandy obstacle course, are now being hauled out. But there is still that sad little stretch of trail nearby that should probably be renamed the Spooky Forest because the trees here adorn so many plastic bags and debris they look clogged with ghost decorations from Halloweens past. If you've been wondering what's up with your favorite park that's famously built to flood, but also famously recovering from 39 feet of floodwater and sediment damage thanks to Harvey, we now have some answers. 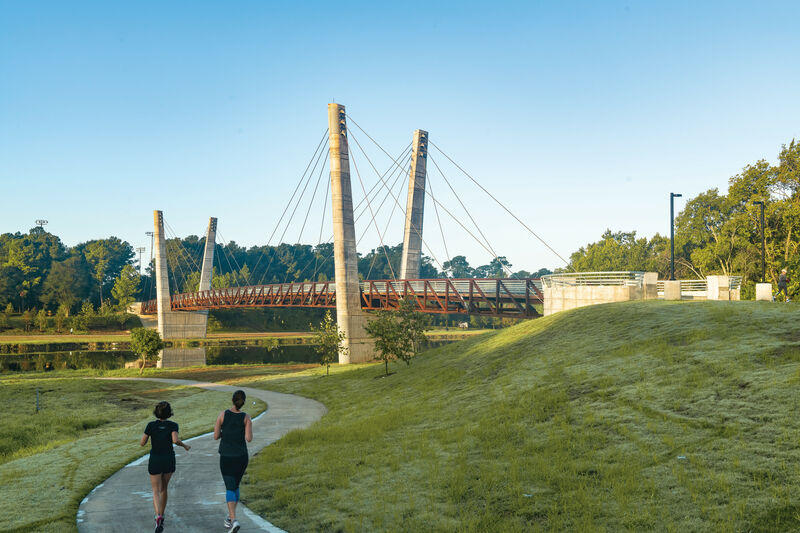 The president of the Buffalo Bayou Partnership, Anne Olson, appeared on The Houston Chronicle's Looped In real estate podcast this week for a very informative interview about where Buffalo Bayou Park is at seven months after the storm. Olson estimates that it will take about a year to a year and a half before we're seeing grass growing and more healthy trees lining the bayou, and projects to spend a total $2.5 million in funding before the recovery efforts are completed. 30,000 cubic yards of sediment, which basically traveled downstream from River Oaks properties and Memorial Park, have been removed from the bayou at a cost of over $1 million, funds that were raised privately by Buffalo Bayou Partnership. The sediment removal is almost complete, Olsen says. Testing was performed and found that the silt was okay to remove without any special measures, so no you will not die if it gets on your skin. Work on the dog park is a touch behind schedule. Sediment removal within the dog park isn't complete yet, and new design changes are planned, including the removal of the large dog pond. The small dog pond will then be incorporated into the large dog pond area. A rep for Buffalo Bayou Partnership tells Houstonia, "Our goal is to have many of these improvements completed and the dog park open by summer." Buffalo Bayou Park lost 400 trees in Harvey. Local nonprofit Trees For Houston has partnered with Buffalo Bayou Partnership to donate trees and provide volunteers to plant them. If you want to volunteer, you can sign up online. Some Hike and Bike Trails and Kinder Footpath sections still need to be fixed, but the Harris County Flood Control District is actually in charge of sediment removal and the rebuilding of these damaged trails, including areas behind The Dunlavy, the Wortham Fountain, and the north side near Montrose, among other spots. That cost estimate is around $3 million. Houstonia has reached out to HCFCD for comments concerning the timeline for these areas, and will update when we hear back. 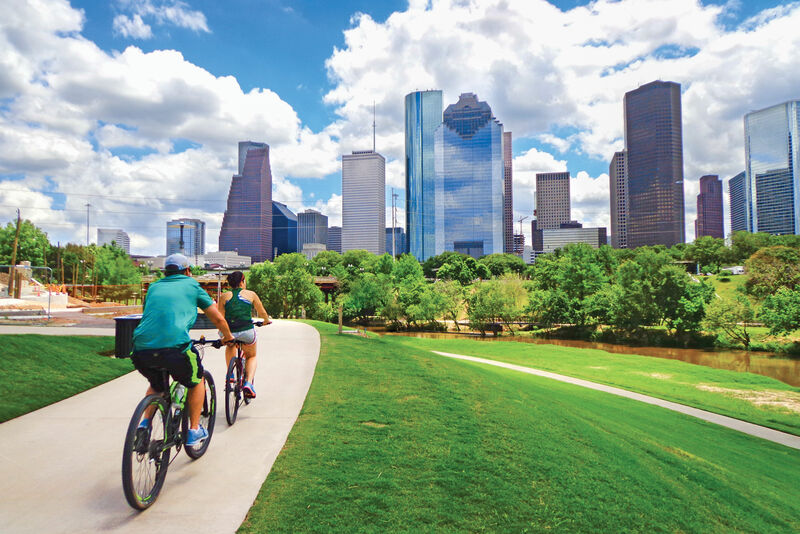 Harvey delayed the planning of the Buffalo Bayou Park expansion into the East Sector by several months, but the 30-year plan should be finalized by end of summer. Olsen says that these eastern banks are wider and flooding issues will not be the same as they are downtown, but there was still some erosion after Harvey. Buffalo Bayou Partnership is hoping to expand to the East End and Fifth Ward in a way that's both authentic and inclusive for residents, many of whom are obviously concerned about gentrification as the bayou and surrounding areas are developed. Sounds like most residents want the same things when it comes to the park's expansion though—kayaking, hike and bike trails, performance spaces, and of course, a dog park.